In March we went to the pub. This should be a tax deduction. You may think that we go to the Wallaroo Hotel for mere merriment and self-indulgence. The truth, however, is that the local Coolatai Establishment is a wealth of agricultural and investment opportunities. So it was in March when we overheard “that block opposite the tip is for sale”. Our ears pricked up: a five acre block on the Coolatai Creek, with bitumen road frontage, bounded by stock route and only 6km from Rocky Springs. We started thinking of pumpkins with creek water, all weather access for the loading and unloading of stock when Rocky Springs is out of bounds after a sniffle of rain, and cheap agistment on the stock routes. So off we went to the Warialda solicitor. This was an experience in itself. Imagine a solicitor’s office: quite plush, maybe a leather couch or two, modern décor, the smell of new carpet. Now let me introduce you to the Warialda version. Firstly it is hard to find the office until you see an A4 sheet of paper taped to a grubby window. You enter through a crappy door and are greeted with a dingy and dank corridor before another sheet of paper directs you to the reception: water stained, thread-bare carpet, peeling paint on the ceiling and consequently also on the thread-bare carpet, a small and shabby computer desk and a couple of second hand chairs. With a smile on my face I ask the receptionist if the rent is very high. Seriously she says she doesn’t know. I figure I should enjoy the moment as it wouldn’t be this bad in the professional chambers. How wrong one can be. When we were eventually ushered into the solicitor’s inner sanctum, chaos reigned. In the place of framed degrees and plaques declaring membership to some antiquated solicitor’s board, there was an entire wall of children’s paintings. Very bright and cheerful, just not what I was expecting nor were the crusts of bread and scattered toys that we had to step around to reach the cluttered desk. 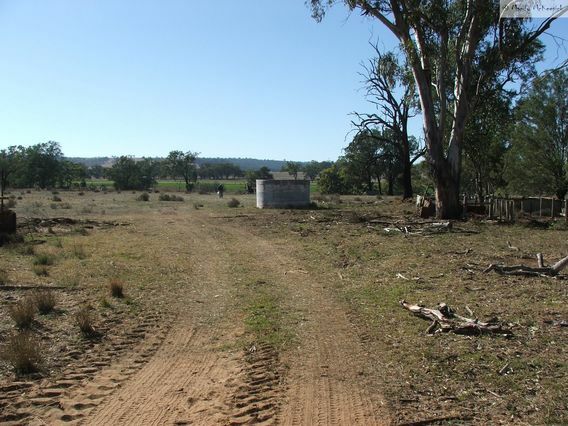 I was feeling less than impressed with the Warialda solicitor, but this was Coolatai real estate and therefore a cash transaction, and after we denied all solicitor-money-making suggestions we found ourselves the proud owners of another property. In the footsteps of Sir Sidney Kidman, a strategic purchase. 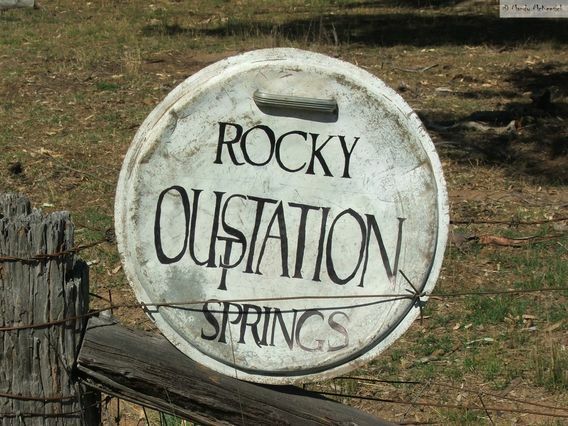 In the words of my witty husband – The Rocky Springs Outstation. 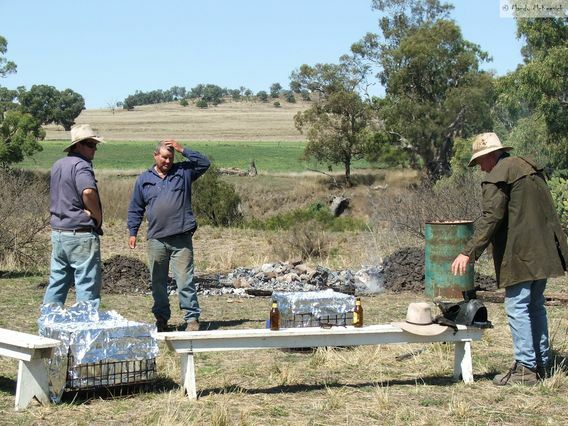 The Outstation, as it is now fondly known to the local community, may be across the road from the tip but in the last hundred years there has been nothing from the Outstation that has made the short trip across the road. A piggery, a sheep feeder, a farrowing pen, rotting batteries, a dozen leaky tanks, oodles of old poly pipe, a bottle dump, an old car body, an outdoor loo, frame of a cottage, twisted metal, a thousand sheets of rusted corrugated iron – you get the picture. 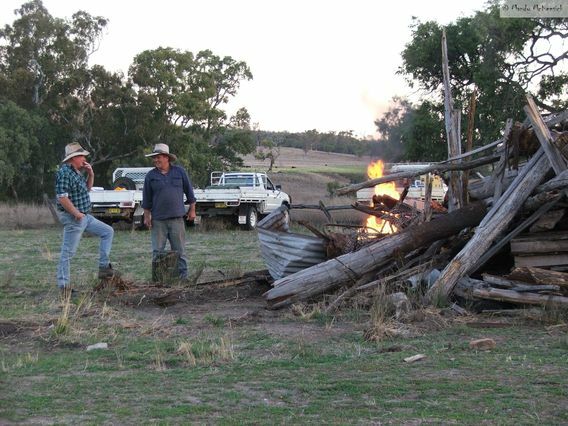 We started attacking with the tractor and the ute. Anything that would burn was dumped into the old cottage frame; if it was metallic it went across the road along with the plastic. In effect we emptied the Outstation and filled up the tip. One of the locals took away half of one of the tanks, The Lizard Man went looking for geckos under the corrugated iron, we sold $60 worth of batteries to the scrap metal joint in Inverell, sold the sheep feeder for $100 and swapped the farrowing pen for two lambs for the freezer. All up we managed to pay for the solicitor’s bill just from our scavenging. Sitting at the Outstation one afternoon, covered from head to toe in dust and grime from a day moving junk, we stopped to ponder the largish pile of timber in the middle of the five acres. And then some ideas started to flow. Brian had a fiftieth birthday coming up. We could hold a bit of a party in the paddock. Maybe we could do a hangi and raise some money for the tennis club as well. Fast forward to 12th September. There will be a hangi all right. For about a hundred people. The tickets have been selling well in the last week and Coolatai has turned up in force to help Brian run the show. 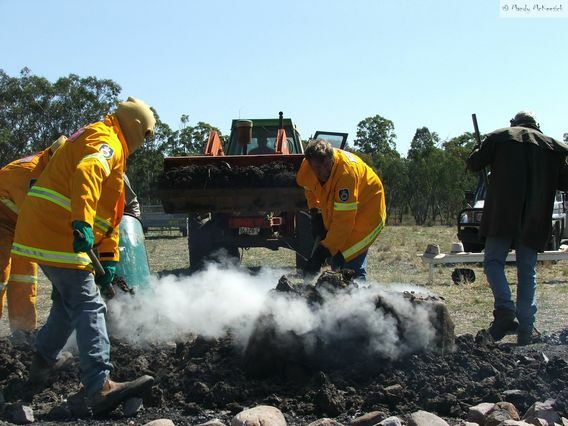 The hangi fire is lit at 11am closely followed by the opening of the first stubbie at 11.01am by the Guardians of the Hangi. The baskets are full of food: a lamb from here and a turkey from there; two legs of pork from two different families but apparently from the same pig, chickens, spuds and pumpkin. At 1.30pm the rocks are hot, the baskets are ready and then it is all systems go. 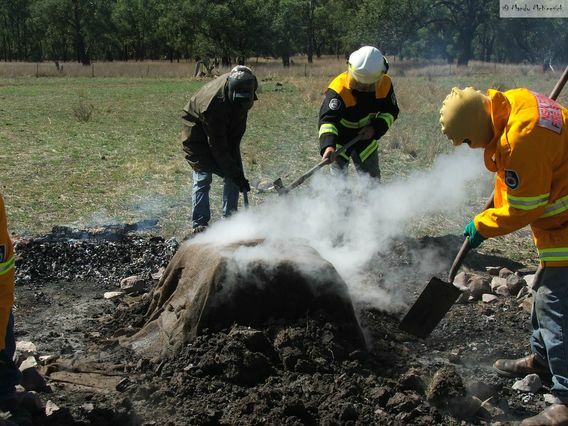 As you can imagine it is all rather hot around an outdoor oven pit so the Guardians raid the local fire brigade shed for protective clothes and, under orders from the Hangi Chief, work quickly to get it all sealed. Putting wet hessian over the baskets. The lady in pink has the important job of keeping both hessian and Guardians wet. With the rush over the Guardians of the Hangi take on their stewardship role – on the lookout for vents of escaping steam and wayward bottles of beer. Indeed they do their job so well that they are still guarding at 7pm and are getting nervous because they have lost their leader who has temporarily gone off socialising. There have been trailers delivered to the Outstation to act as tables, a trayback truck will provide a stage for the entertainment later in the night, generators have been set up and there is even a port-a-loo borrowed from the council. 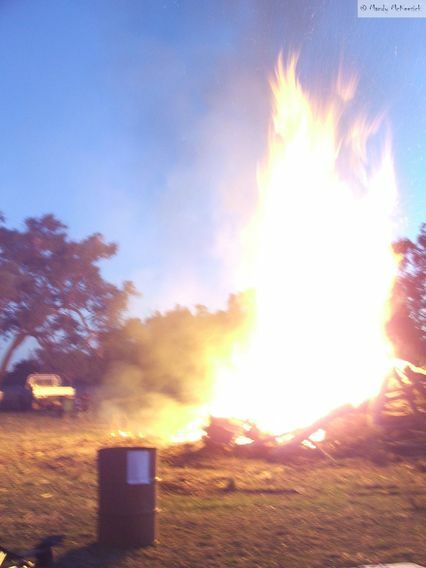 The crowds start arriving and Brian and Col, looking like two teenage fire-bugs with a 20 litre drum of diesel, light up the largish pile of timber in the middle of the five acres. Two firebugs and a drum of diesel. Do not try this at home kids. Brian had applied for a fire permit for a campfire. Anyone not sure on the location of the Outstation instantly has all worries dispersed. 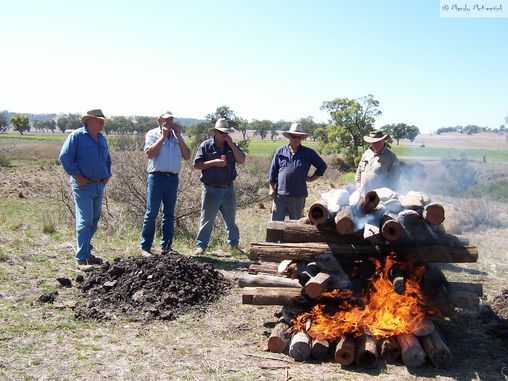 This particular campfire can be seen from Warialda. 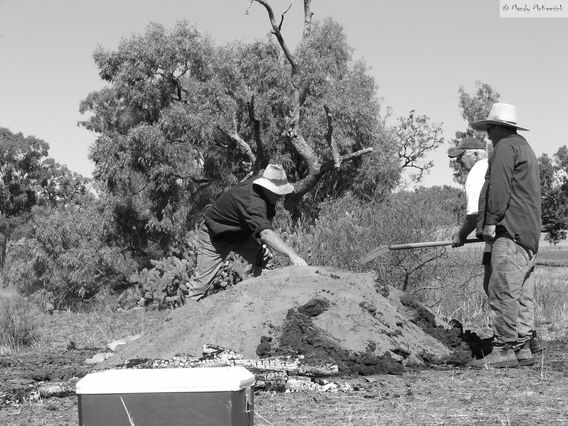 With their Chief returned the Guardians set about digging up the hangi with a curious crowd of onlookers. Then it is onto the trailers and a hundred people line up for their tucker. Later, with bellies full and stubbies empty, the entertainment starts. Coolatai really can turn it on when they put their collective minds to something. 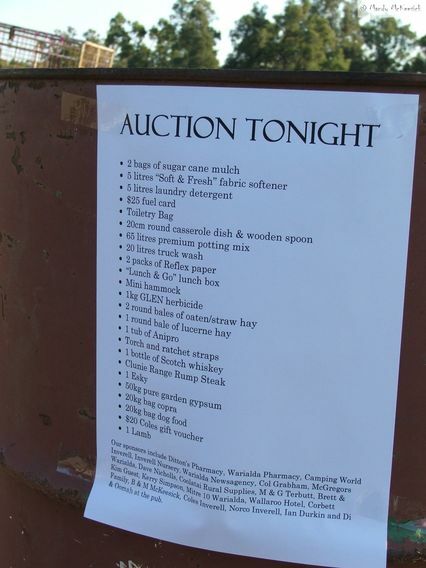 Five days prior they have decided to have an auction as well. 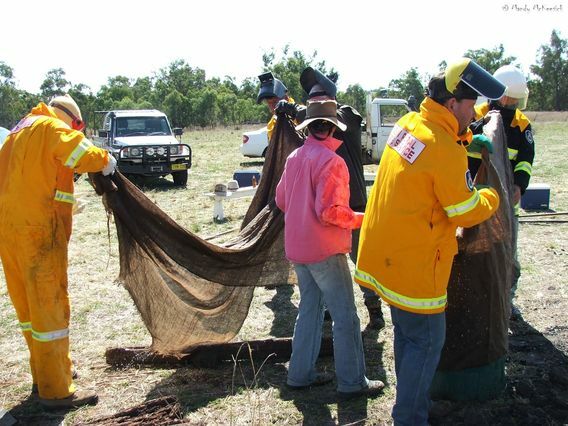 Two sisters headed to Inverell and must have fleeced everyone they knew for donations, so on the truck there is herbicide, garden mulch, truck wash, washing detergent, dog food and a multitude of other agricultural products. But that is only half of it. “This is fun” thinks the rest of the community and suddenly, added to the truck, are bales of hay, promises of lambs for the freezer, cartons of eggs, gypsum for the garden, wine and port from the former publicans and whiskey from the current one, even a joy flight has been thrown in and the pilot doesn’t even own a plane at the moment! The auctioneer is full as a boot and in fine form. He himself holds the highest bid on an item, only to be out-bid by his wife. He bullies and sways and mentions, part-way through, that this may not all be legal so please don’t say anything. The bidding is fast and furious. The two sisters fight over the garden mulch and the publican and the single girl fight over the joy flight. A lady is conned into buying the lucerne hay as the auctioneer has a few hours earlier conned her into buying a racehorse. 500 litres of molasses mix sells to a bloke who isn’t even at the auction, and Col bids against himself to win the bottle of port. 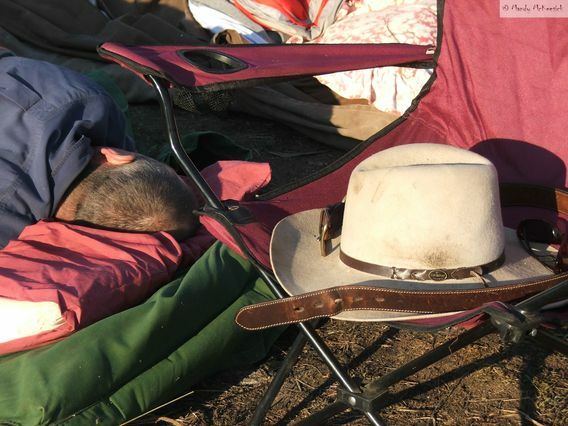 At the end of the night, when the main crowd has dwindled away and the stayers are polishing off Col’s port around the still burning campfire, we ponder what has just happened. 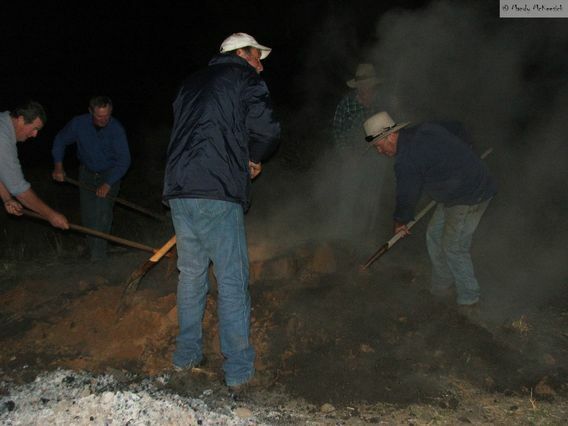 Between the hangi and the auction, nearly $3,000 has been raised for the tennis club which pays for the electricity not only for the courts, but for the hall and village water bore. But more than that, there is a buzz about the village. It has been over nine years, they say, since Coolatai has come out to an event in these numbers. 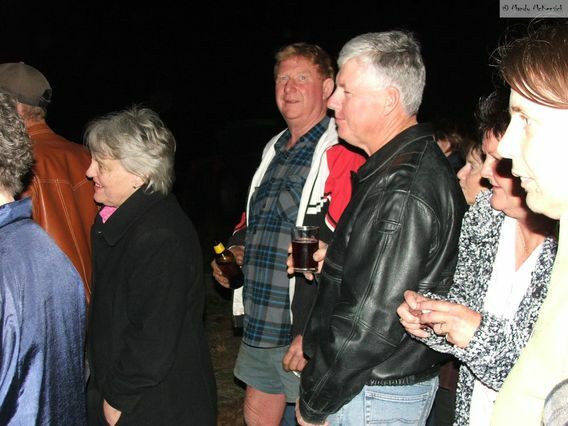 People who avoid the pub and other social outings are raving about Brian’s Hangi. There is a crowd from Yetman and Yetman people rarely come to party in Coolatai. The mood is like a celebration. The night has been a run-away success and plans are already being made for next year – after all the locals want time to get organised. This entry was posted in They're a Weird Mob and tagged bush entertainment, Coolatai, coolatai hangi, hangi, party in a paddock. Bookmark the permalink. 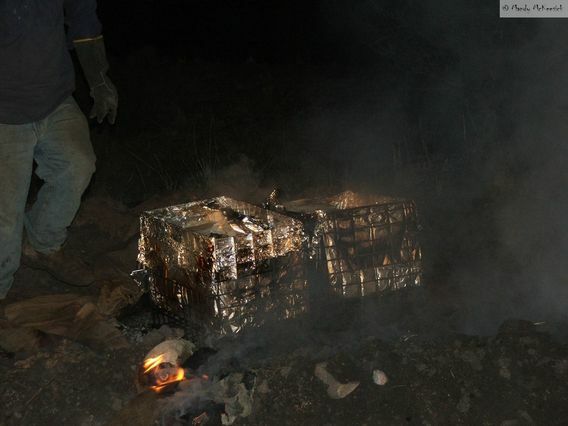 Great story – next year you will have to add kumara to hangi along with rotten corn. I’m sure the kumara will go down a treat with the locals but you might struggle finding a stream for the rotten corn and it is an acquired taste. I love a good kumara (red sweet potato) but I think I would baulk at the rotten corn (are you serious?). And even though it’s traditional, I don’t like cabbage in my hangi. From what I think I know about you, you would have had a great time. I’ll invite you to the next one! 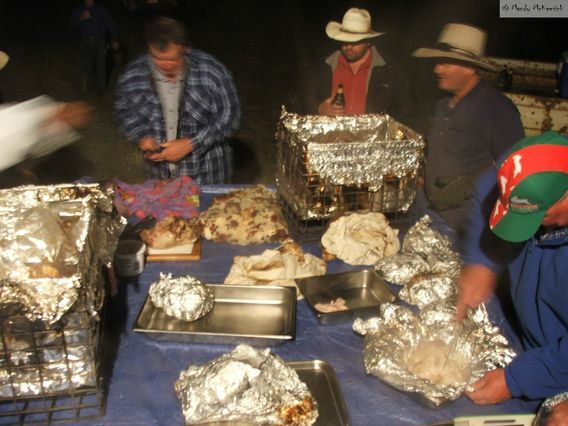 Love a good hangi…& felt that I was there. Thanks so much. Now where’s my stubbie…? 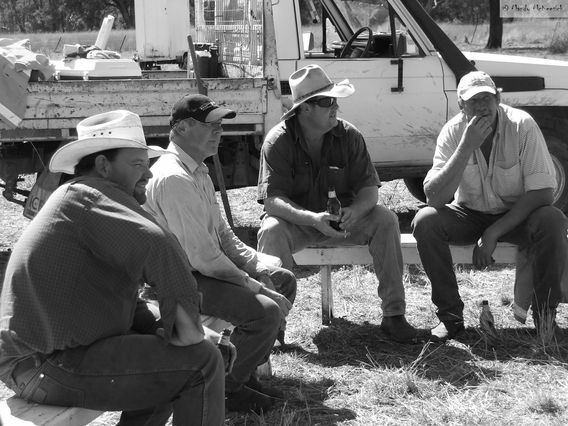 G’Day Jo, I’ll put you on the invite list for the next one ….. and have a cold stubbie waiting! You Coolatai people sure know how to have a good time! Shall I put you on the invite list as well Rob? Wow that sounds like great fun and a good night out. Glad it went so well to. 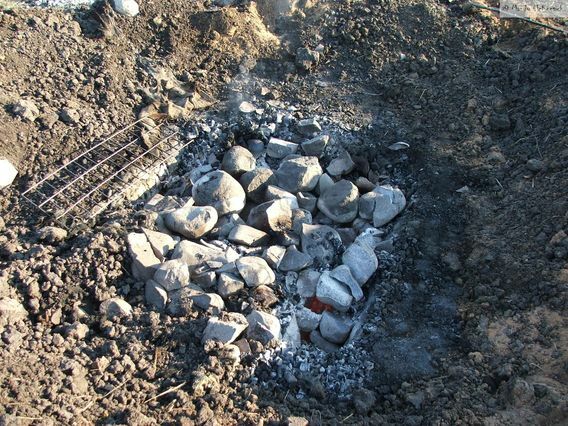 Thankyou Anne, have you been to a hangi before? Brilliantly described Mandy. I need to tap into the Coolatai bush telegraph more. How come I missed knowing this was on??? Sorry I missed it. Next one!! Fiona, you only missed it because it was on in 2009! Nevermind, I think it’s about time we had another one, but maybe when there’s not a frost on the Outstation. Hello, I just found your blog from the Faces Of Ag page and I truly envy you!! For the longest time I have wanted to live in Australia. It just seems like a great place to live. I have enjoyed reading over a few of your blog posts and I truly have to say they are great and I will defiantly be following your page. I currently live on a small farm (10 acres) and we raise Lowline Cattle. I also have 2 goats which I will be showing this year along with 3 hives of bees. I hope you come and check out my blog! Thanks for the lovely comments and I hope you make it out to Australia one day. Let me know when you’re coming and I’ll show you around! 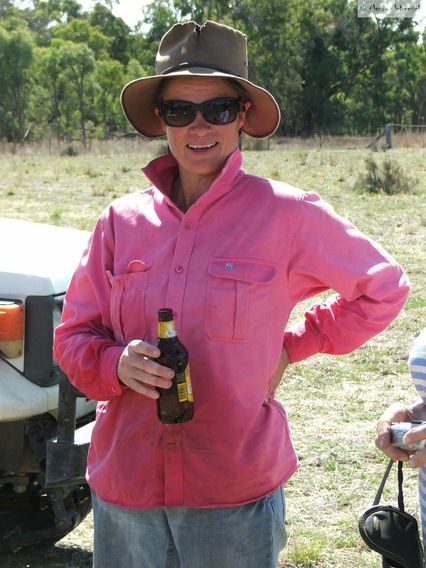 I’ll jump over and check out your blog shortly but I’ve just got to muster a mob of cattle first.